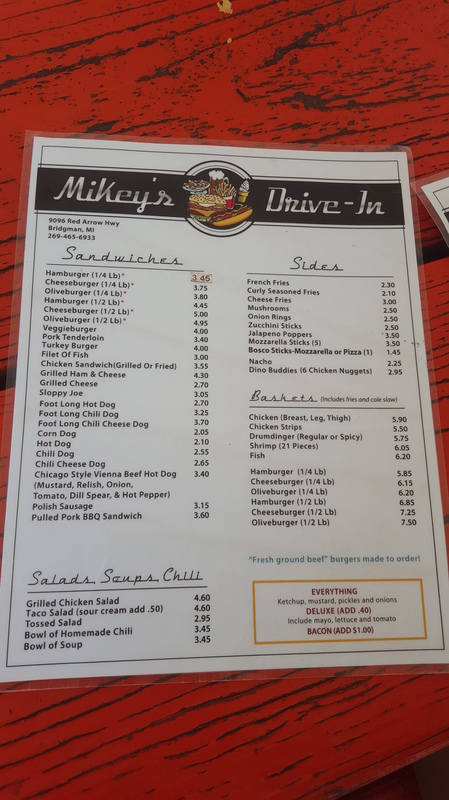 If for some reason you are cruising down I 94 and you suddenly you are craving the dankest cheap diner eats – you’ve got to stop off for Mikey’s Drive In. Cruising down I94 is the city of Bridgman wedged between two state parks : Grand Mere State Park & Warren Dunes State Park. Mikey’s Drive In is located at 9096 Red Arrow Highway, Bridgman, MI 49106 . You’ve got a few different options of where you could dine … A) in your car ! they’ll bring a cute tray to attach onto your window B) inside the small shop or C) at the picnic tables under a tent ! Since we were a big squad we decided to post up at a picnic table outside. Ft. in the photo is Ozie ! Follow him on Twitter for the latest and greatest info about tech and travel. 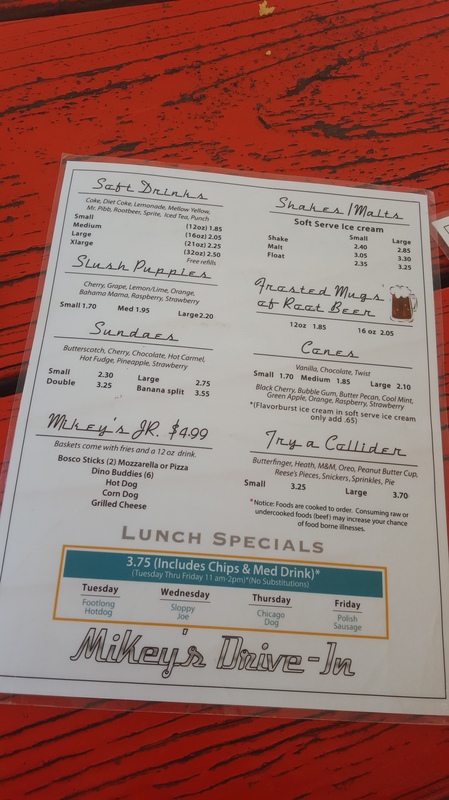 We basically ordered the WHOLE menu as the items range from about $1.00 to 3.50. Here’s a sneak peak into what’s available to order ! 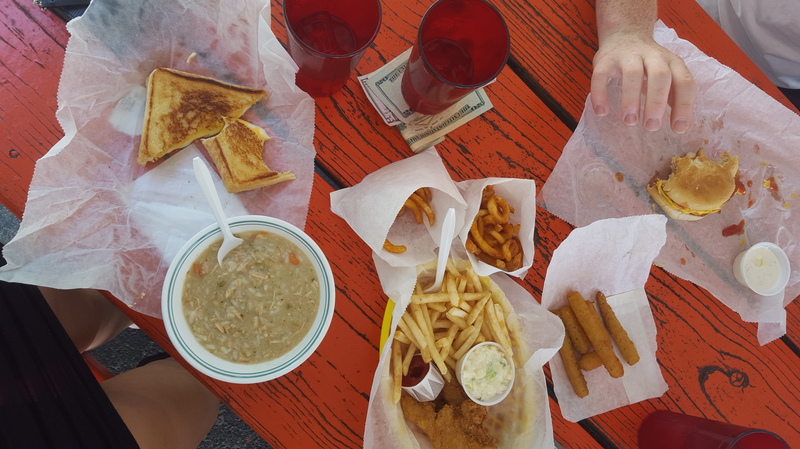 We went with a boat load of Grilled Cheeses, Chicken Fingers & Fries, Seasoned Curly Fries, Zucchini Fries, Dino Bites, Classic Burgers, Chicken Sandwiches, Root beers in cold mugs, and Homemade Chicken & Rise soup. YOU MUST GET THE SOUP ! I would have taken home a gallon of this soup if I could have! Some of the spread featured in the photo ! We feasted like Kings & Queens for about $75. 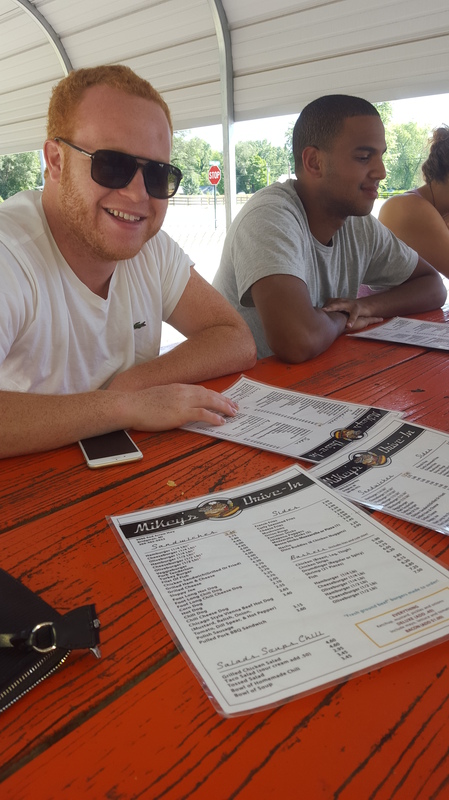 It was a lovely brunch at Mikey’s Drive In! If we are back in the area I know this spot will totally be a tradition. It is always great to get together with your squad in a remote spot to really chat and bond. I love supporting local spots and sharing them on my blog! This is beyond vile and potentially delicious … PIZZA FRIES … I’m not quite sure how no restaurant out there has really come up with this as a staple … its kind of taking the cheese fry to the next level by adding pepperonis and some Italian spices. whose gonna try to re create this first? Hope you didn’t think that Child Obesity didn’t just go down in the US…. apparently kids today in Japan & Korea are taking eating to the next extreme. This group of kids is FRY Binging here at a Local McDonalds! This rambunctious group of friends thought they’d take advantage of a new promotion offering a cheap deal on extra Large French Fries ! The friends thought it’d be a fun idea( sure as hell looks it) to purchase $250 of FRENCH FRIES and lay out all the fries across a bunch of trays …. DREAM COME TRUE. Unfortuntely, they caused a huge stir and got kicked out of the Mickey D’s !